Listen to "Walden Two" on your iOS and Android device. 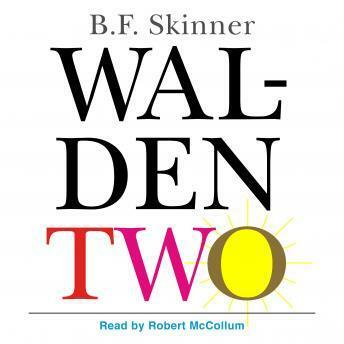 From author and psychologist B. F. Skinner, regarded by many as the most important and influential psychologist since Freud, comes "Walden Two". This fictional outline of a modern utopia has been a center of controversy ever since its publication in 1948. Set in the United States, it pictures a society in which human problems are solved by a scientific technology of human conduct. The novel describes an experimental community called "Walden Two", whose members are happy, productive, and creative; their happiness derives from non-nuclear family life; amazingly limited work hours; communal child-raising; free affection; the creation of art, music, and literature; opportunity for games of chess and tennis; and ample rest, food, and sleep. It's a utopia inspired by the experience described in Henry David Thoreau's "Walden", but "with company". Fans of philosophical writers like Ayn Rand or Karl Marx and imagined utopia's like Aldous Huxley's "Island" will enjoy broadening their minds with the challenging ideas described by Skinner in this classic novel.